The Machaeranthera is a member of the Sunflower Family. This slender plant grows to a height of about 4 feet and has 3" green leaves with ridges on the edges. The Machaeranthera typically grows in washes and desert flats at elevations between 1500 and 2500 feet. 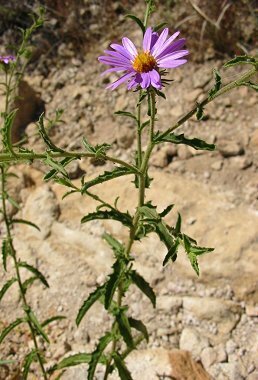 There are more than a dozen species of Machaeranthera (pronounced mack-uh-RAN-the-rah) in Arizona. The plant blooms between April and may, producing a purple daisy like flower with a yellow center to 1" in width.